Several types of small farm animals, including chickens, ducks and rabbits, like the security of a nesting box for sleeping and raising young, but they need boxes of different sizes. 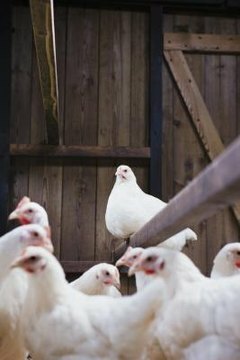 Chickens seem to prefer a cozy nest box that holds two or three birds in close quarters, for example, so a dozen chickens would ideally need four to six boxes. You'll have to design your nest boxes to accommodate your animals' preferences. Mounted nesting boxes may be made of wood or nontraditional materials. The boxes attached to the side of a coop, hutch, or tree with bolts or screws. Mounted boxes provide a secure place for active animals to sleep; their elevated status is the biggest advantage of this type of box. Being securely mounted, the box can't tip and injure animals or break eggs. But it's harder to properly clean a mounted box. Like mounted boxes for animals, removable nesting boxes are made from wood or nontraditional materials. The advantage of removable boxes is that they are much easier to clean than mounted boxes. Owners can simply pull the boxes out of the coop or hutch and hose them off to get them clean. Removable boxes need to be heavy, with wide bases to prevent tipping. If you use light material, attach the boxes to one another for support. You can make wooden nesting boxes from scrap wood such as old pallets or wood left after another project. Plywood works for nest boxes. Make them about 6 inches tall with bases of 12 inches by 12 inches or 12 inches by 18 inches, depending mainly on the amount of space you have available. Small animals can cuddle in the boxes or perch on the sides when not nesting. Use your creativity when making nesting boxes from nontraditional materials. Five-gallon shop buckets, tipped over with slightly raised openings to keep the young from falling out, can be stacked to create an eye-catching pile of nest boxes for a large flock. Milk crates work as mounted nest boxes, though they are a little bit too tippy for removable boxes unless weighted. Cat litter boxes also create a sturdy, low-edged nest box option. What Kind of Nests Do Finches Make?